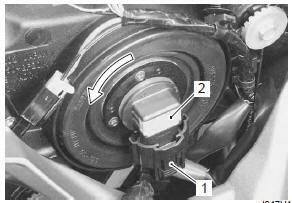 Disconnect the headlight (low beam) coupler (1). 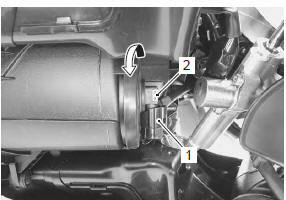 Remove the headlight bulb/socket (low beam) (2) by turning it counterclockwise. Replace the headlight bulb (low beam) with a new one. Remove the body cowling cover. Refer to “exterior parts removal and installation” in section 9d . Disconnect the headlight (high beam) coupler (1). Remove the headlight bulb/socket (high beam) (2) by turning it counterclockwise. Replace the headlight bulb (high beam) with a new one. Disconnect the position light socket (1). 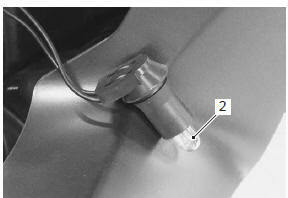 Replace the position light bulb (2) with a new one. Reinstall the position light socket.